Nicole Caldwell is a journalist, author, educator, and first-generation farmer living in the Thousand Islands Region of New York State. Caldwell grew up in New Jersey, earned degrees at Hampshire College and Columbia University's Graduate School of Journalism, and cut her teeth at newspapers and magazines in New Jersey and New York City. She left the city in 2009 to found a sustainability education center, organic farm, animal sanctuary, and artist colony called Better Farm. Her work has appeared in Martha Stewart Living, Thrillist, Playgirl, Mother Earth Living, Green Matters, Stacker, and many other publications. 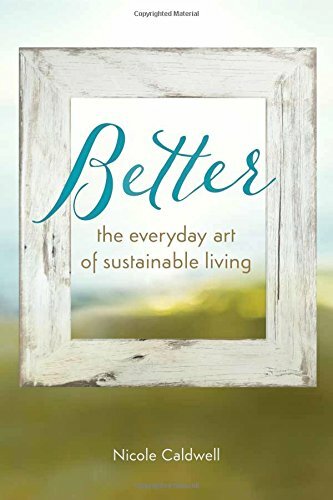 Her first book, Better: The Everyday Art of Sustainable Living, came out in 2015. Her second book, Farm + Land (co-authored with Freddie Pikovsky), is set for a Fall 2019 release. Behind the scenes of Caldwell’s book, Better. The people and philosophy of Better Farm. Learn more about Caldwell’s sustainability campus, artist colony, animal sanctuary, and organic farm in Redwood, NY.